I apologize for the terrible picture, trust me the food tastes much better than it looks! I first saw these done on Emeril years ago (at least 10). It was one of those "I saw him make it that day, I made it that night" recipes. I don't even know how true it is to the original anymore, but I really enjoy them. Just give yourself the time to make it. Step 3 - Be really careful with this part! - scoop most of the potato out of the shell (I've broken the shell doing this, try not to do that :o)-one of the reasons the picture looks so wobbly!) - put all the potato filling into a medium bowl. Add your favorite potato toppings and mash everything together. Don't worry about the picture. After reading the ingredients, I knows these were over the moon good! My husband would love these! Thanks for sharing! I think the picture looks great! Can't wait to try this. My stomach is growling out loud looking at your twice baked potatoes!! Twice baked potatoes are all I need to make a very satisfying meal. I never knew they were so easy! I'll have to remember this one! You've been quite the busy blogger! I love recipes that make you want to make them as soon as you see them. They must be good. Oh these sound beyond delicious. I love them, your picture is just fine. 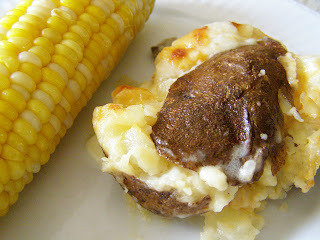 My kids were just begging me to make some twice-baked potatoes after trying them at a friend's house! yum, I'll take one of those potatoes.. and some of the corn!